The new SAILOR 4300 L-band antenna is the pinnacle of L-band terminal design, representing over 20 years of unmatched maritime L-band expertise and quality. 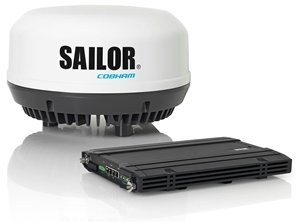 SAILOR 4300 L-band is the first in Cobham’s Iridium Certus Connected range of terminals. It is the perfect choice as either a high-performance, stand-alone terminal to upgrade your vessel communications, or as a dependable backup solutionfor your existing VSAT system. Through Iridium NEXT, SAILOR 4300 L-band enables fast internet speeds suitable for both data-heavy applications and everyday usage. The terminal minimizes total cost of ownership with low hardware costs and no scheduled service requirements, and is fully supported through our Global Service Network. Please complete this and return to OCENS for service.